This Japanese Maple bonsai started life in the Summer of 2002 as an airlayer taken from a full-sized Acer palmatum growing in my garden (that I had also grown from a similar-sized sapling). At the time the image above was taken, the trunk was just 1/2" or 1.5cm thick. The young tree was planted on top of a tile to ensure a shallow rootball and good nebari (surface roots) and allowed to grow freely in the ground for the next 4-5 years to help thicken up the trunk. The image above shows the tree just 3 years later during the Summer of 2005. It has been allowed to grow freely throughout each growing season to encourage rapid thickening of the trunk and then pruned back each Autumn to develop a pleasing trunkline. A close up image of the trunk during the Summer 2006. Various shoots around the trunk have been allowed to extend, each serving a purpose towards the final design; some are being allowed to extend to encourage thickening of the trunk, others will eventually become part of the trunkline itself. In the Autumn of 2007 the tree was finally lifted from the ground, as is necessary when developing deciduous bonsai, all of its branches were removed and a new branch structure needed to constructed. The tree was first potted into a large black nursery tub and then finally into a bonsai pot in early 2009. 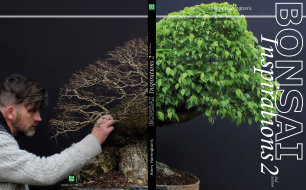 Autumn 2010: the author pictured with the bonsai 4 years later. New branches have been developed in the past 4 growing seasons; each year the new shoots being allowed to grow freely before being pruned back hard and wired to shape each Autumn. This ensures that the branches have taper and are not a uniform thickness.